27 Nov No detail too small…. We always like to go to town when it comes to making our clients look good. And what better way to promote the use of your client’s products around Central London than an open-top bus tour of the capital itself? This is exactly what we did as part of ABB’s recent Capital Markets Day event, which brought journalists from around the world to London to find out more about the company’s ambitions for the next five years. Taking our idea from the popular open-top tour buses that are a ‘must-do’ for any tourist, we put together our very own whistle-stop tour of our client’s major reference sites. Here’s a quick look at how we quite literally put our client’s products on the map. Did you know that buses are prohibited from travelling down the Mall? Or that there are 26,000 streets within a six mile radius of Charing Cross? These were just some of the things we discovered as we put together both the route and the double-sided map that would be the focal point of the tour. DID YOU KNOW? The Routemaster celebrates its 60th anniversary this year? The destinations were easy enough to choose, but it was allowing for road closures and traffic congestion which proved a challenge. Just in case Plan A went awry, our MD, ever the perfectionist, cycled the provisional route two weeks before, duly noting the details of every road work, one-way street, prohibitive by-law and anything else that could affect the route. That being done, a route was finalised and a map painstakingly produced, drawing on a variety of sources for its inspiration. For several days, our studio was awash with maps including the famous London A to Z, London tour guides and Dorling Kindersley pictorial books, trying to fit as many details as possible into the A2-sized format. The design team’s contribution didn’t stop there, with invites also made to ensure that the journalists were clear on how to get to the bus stop on the morning of the tour. These featured the iconic Tower Bridge image for both consistency and effect. Starting at The Gherkin, where ABB switchgear controls the dual power supply, the tour took in a variety of some of London’s most famous landmarks where ABB equipment has been installed, including Tower Bridge, The Shard, the Tate Modern, Trafalgar Square and the London Eye. Of course, no tour of London is complete without a tour guide, who was able to give chapter and verse not only on the sights of London, but also information about the ABB equipment featured in each one. We also made sure to film the whole experience to communicate the diversity of landmarks that ABB serves. The day wasn’t limited to the Routemaster itself, as journalists were treated to a midmorning tour of Imperial College London. Recently voted as the world’s second leading university, Imperial College London is home to a new carbon capture pilot plant, which uses ABB drives, motors, instrumentation and automation to give students a truly hands-on experience of operating a real-life process facility. After such an exciting start, journalists were then treated to a delicious lunch at Claridge’s, a hotel renowned for its timeless luxury. Not that this was the only consideration behind the choice of venue – ABB variable-speed drives also feature in the restaurant’s kitchens. 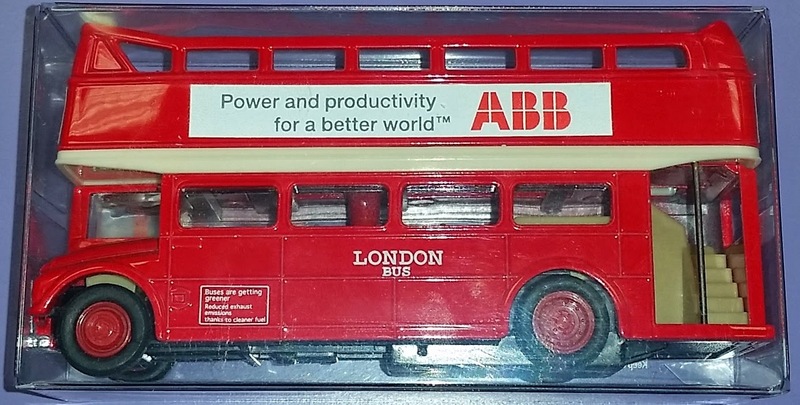 Finally, as a final touch to a brilliant day, the toy London bus, complete with ABB logo, was placed on each of the journalists’ tables at Claridge’s. The journalists were delighted to receive this reminder of their experience. With cautious planning and great attention to every component of the day, the Capital Markets event achieved its objective– securing a great impression of our client’s business – providing automation and power technologies to the world’s most treasured landmarks in London.